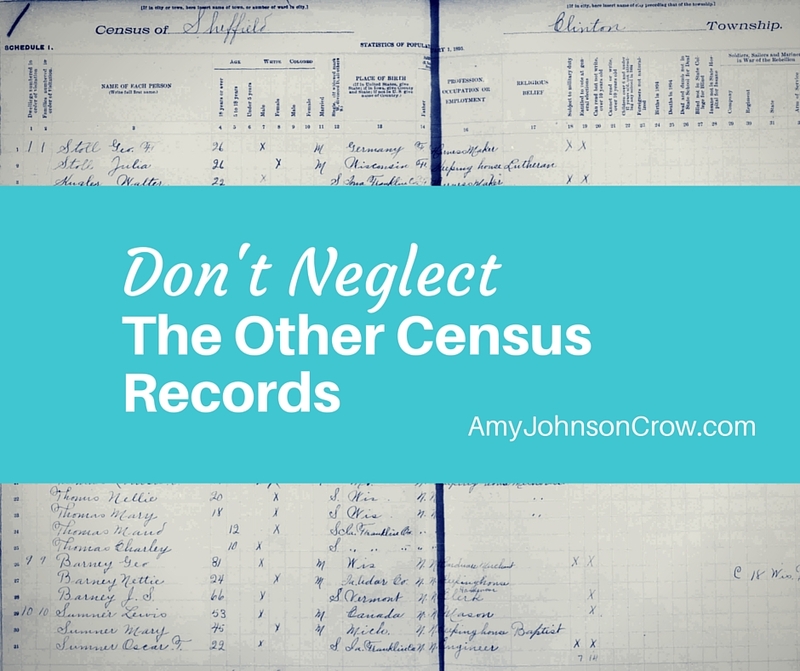 The census has become the kleenex of the genealogy world. When someone says that they need a kleenex, they almost always mean they need a disposable tissue, not that they need Kleenex™ brand tissues. It’s similar with “the census.” The census also has a problem with identity. “I found him in the census” usually means “I found him in the Federal population census.” But just like there are other brands of disposable tissues, there are other types of census records. Many states took their own census records in addition to the ones the Federal government took. Two cool things about these: most were taken between the Federal censuses (which gives us another point on an ancestor’s timeline) and many have questions that weren’t asked on the Federal schedules. The 1895 Iowa state census, for example, asked for the person’s religious belief. Many state censuses are available on FamilySearch and Ancestry. Some locations — cities, counties, etc. — took their own censuses. They usually weren’t taken every ten years like the Federal and many state censuses but were done more on an “as needed” basis for a specific purpose, such as assessing militia strength or the needs of local school districts. Local censuses are often in a year different than a Federal census. Again, this gives us another opportunity to put a specific person in a specific place at a specific time. Even the Federal census has other parts we need to use, in addition to the population schedule. These include the 1890 veterans schedule, the industry schedules, the agricultural schedules, and the “defective, dependent, and delinquent” schedules. The Federal census lulls us into thinking that if it’s a census, it must include everyone. Unfortunately, this isn’t always the case. Difference censuses were taken for different reasons. If a state or a county has to determine potential needs of veterans and their dependents, they don’t need to count everyone; they need to count only the veterans and their widows. 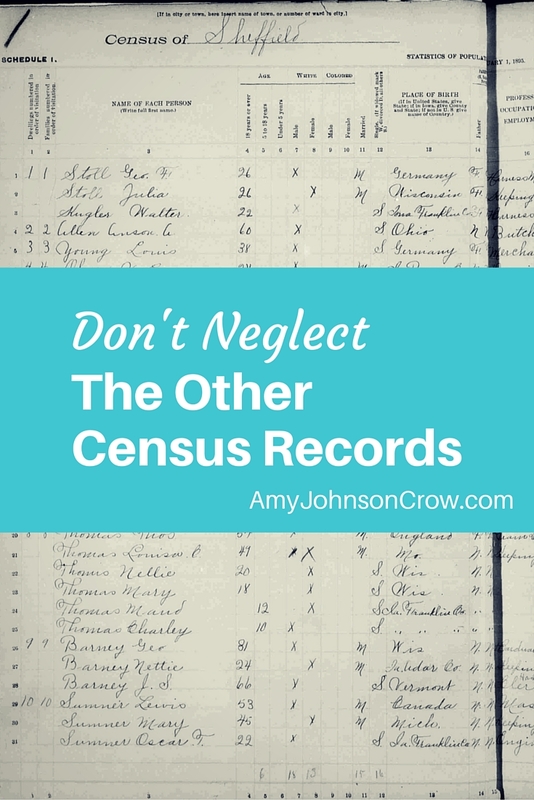 Local censuses often don’t include everyone, as they were taken for a specific purpose. If you need to determine militia strength, you count the people who would qualify to serve in the militia. Pay close attention to who is being counted. Is it everyone? Only males? Only white males? Only males above a certain age? Only veterans? Not every state took a state census and not every town or county took a local census. I recommend two sources for determining if a state and/or local census exists for the area you’re interested in. First, check the FamilySearch Wiki. 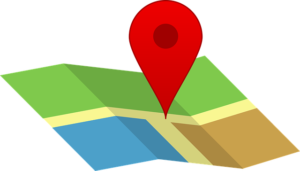 You’ll find a wealth of information about resources available for a given area. Second, tap into the knowledge of the genealogy societies in the area. They know what records exist and where to find them. 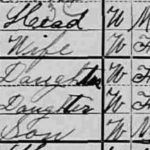 What “other” census records have you used? 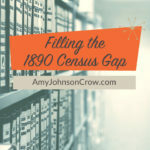 This entry was posted in Records and tagged census by Amy Johnson Crow. Bookmark the permalink. I was reading a posting tonight that addressed how personal information in one’s obituary may vary if published in several different newspapers, depending on who wrote it. I have a suggestion: write your own obituary and leave copies with your spouse, your siblings, your children and/or your attorney. Attach a copy to your will, and with your documents about your last wishes. The obituary should list certain items: 1. Your name, nickname is optional. 2. Names of your parents, your spouse, your siblings, your children, other survivors. 3. Funeral arrangements and your preference of type and place of funeral service or celebration of life 4. List of charities with complete addresses, “in lieu of flowers”. There are optional items that fellow and future genealogists would appreciate being included: 5. Your education. 6. Military service. 7. Work history(s); more people today have held several different jobs in their work history. 8. Civic activities/ involvement, i.e., American Red Cross disaster volunteer, Rotary, DAR, volunteer fire department, Meals on Wheels. 9. Other: I am donating my body to the State Anatomical Board, by letter of agreement, for use as a cadaver for the State Medical Colleges/teaching hospitals. Therefore, my remains will be cremated after the Colleges are finished. Inurnment will take place several years later. Since you are a professional genealogist, I thought content of “obituaries” might be addressed in one of your articles. Always worth sharing a reminder about these alternate census “brands” (I like your analogy). Some of the state census records (Iowa and Kansas, for example) have been particularly helpful for me in pinpointing ancestors’ locations and narrowing time frames when they moved from state to state. Looking at a CO census I scrolled down the page and found others of the same family. I had never thought to do this before. Now I always read the entire page in case there are others listed.